we had a speech last year at DLD about a girl who broke literally every bone of her body practicing this sport... still, stunning to look at. Totally amazing game. Not one thought France could win, not even I. Shame on me, as the "bleus" did a great job last night. We watched the game in a sports bar downtown Budapest, on the eve of the ETRE 07 conference. Amazing mood & spirit. 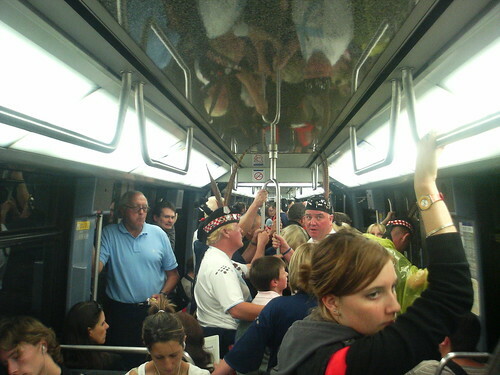 For once, the Marseillaise made sense "allons enfants de la Patrie, le jour de Gloire est arrivé..."
Scots in the Paris metro, originally uploaded by rsepulveda. 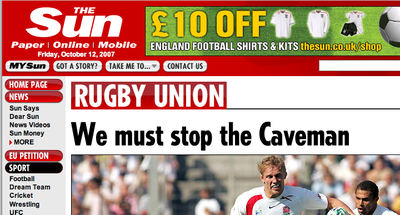 the Rugby world cup is going strong in France at the moment. Nice to see traditional / national costumes in the metro. The NZ / Scotland game tonight reminded me I had to publish this pix taken earlier last week. I mentionned this loosely on this blog earlier: the "Salon du Cheval" is a new customer of vpod.tv: they have been actively shooting the horse fair in Paris, and putting all of that footage on their homepage at www.salon-cheval.com. The organizers were kind enough to give us a number of FREE invitations to the exhibition: we have been giving them to French bloggers who are wiling to go and shoot some video there and publish it with vpod.tv. The idea here is to help share the experience and the emotions of the fair with Internet visitors. So far so good. The fair ends in 3 days on Sunday evening. So if you are in Paris, or are planning to attend, why don't you come by our offices this Friday (near St-Lazare / St-Augustin) and pick up an invitation to the fair for this weekend? Your kids would be delighted. We only required you to be honest and promise to shoot some video that you will share with everyone else. And who knows ? Your video might make it to the homepage of the event ! For more information or to book your free ticket, email us at info at vpod.tv. A big thanks to Orange, and particularly to Edouard for inviting me today to join a big crowd at the Stade de France for a rugby game between France and Argentina. My first time for a sports game at the stadium (I had been there for a few other occasions including a U2 concert), and also my first real rugby game. Thanks to Mat yesterday who spent some time with me to explain the basic rules of the games. Indeed unless you understand some basic tactics, there's not much you can understand from these "bouncers" running into each other at full speed. But I got part of it, and it was great. Dimitri Yachvili from the French team had a few great runs. And it's rather amazing how the game changes in a few seconds with fantastic runs. I thought the game was all about fairplay like in golf, but you could hear the French temper every now and then, whistling and booing. The Argentian team members looked huge to me: meatpackers or dockers :) very impressive. update: my pix are on Flickr. Zoé is the Director of the Salon du Cheval to be held in Paris in early December 2006. 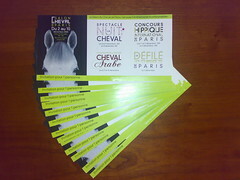 I have 20 FREE tickets for videobloggers willing to go and film the event and report live on the www.salon-cheval.com site using vpod.tv's platform (tag: 'saloncheval06') If you love horses, this is a must!